The holiday season, whether you celebrate Christmas, Hannukkah or any other holiday, is a time for celebrations, family, friends and delicious food. All around the world those celebrating the holiday season traditionally have a special food item to showcase that particular their culture and food. This is a list of the Top 10 Christmas foods from around the world. 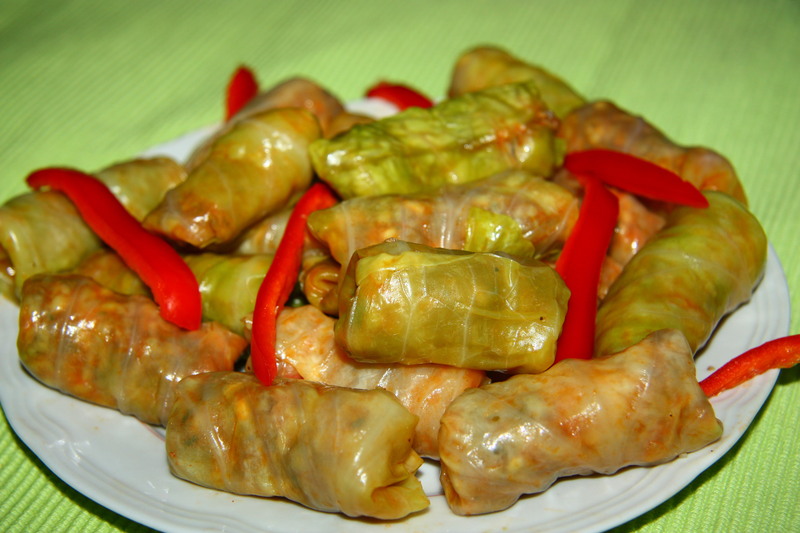 Sarmale (sar-mall-eh)are pickled cabbage rolls or vine leaves can also be used. Sarmale are served during most festive holidays but mostly during Christmas. The boiled cabbage rolls are traditionally filled with pork, beef and rice. Christmas time is when these are the tastiest as pork meat to use in the filling is particularly fresh. 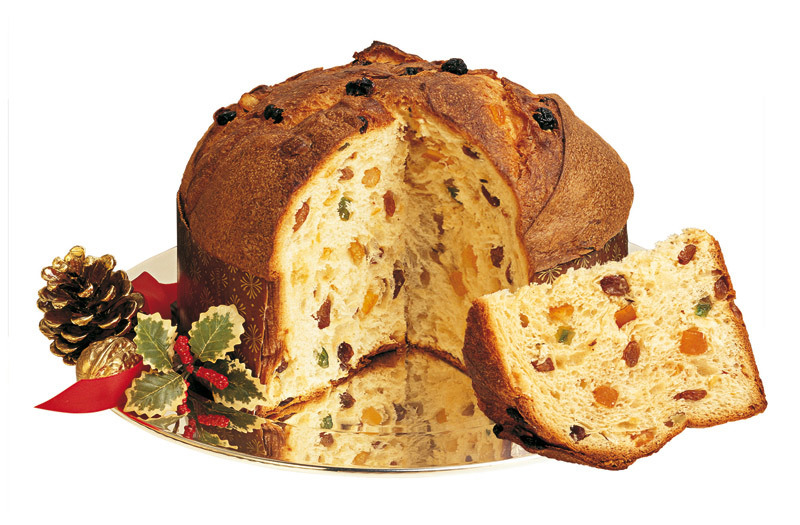 Panettone is a type of sweet bread that originated in Milan, Italy. Panettone is usually enjoyed at Christmas time in Italy, southeastern France, Spain, Portugal, Brazil, Peru, Malta, Germany and Switzerland and is one of the symbols of the city of Milan. Panettone is made from an acidic dough base, similar to sourdough, which gives it a light and fluffy texture. Raisins, citrus zest and other fruits are also mixed in. The bread is shaped like a cupola, with a cylindrical base and domed top. Riisipuuro is traditionally eaten on Christmas morning in Finland. 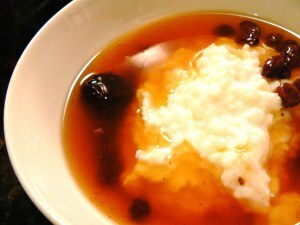 It is a porridge made by cooking rice in milk, similar to the common rice pudding. The porridge is cinnamon, butter and milk or a mix of dried plums. A Christmas tradition is also to put an almond in the pot of porridge and whoever gets the almond in their helping gets to make a wish. 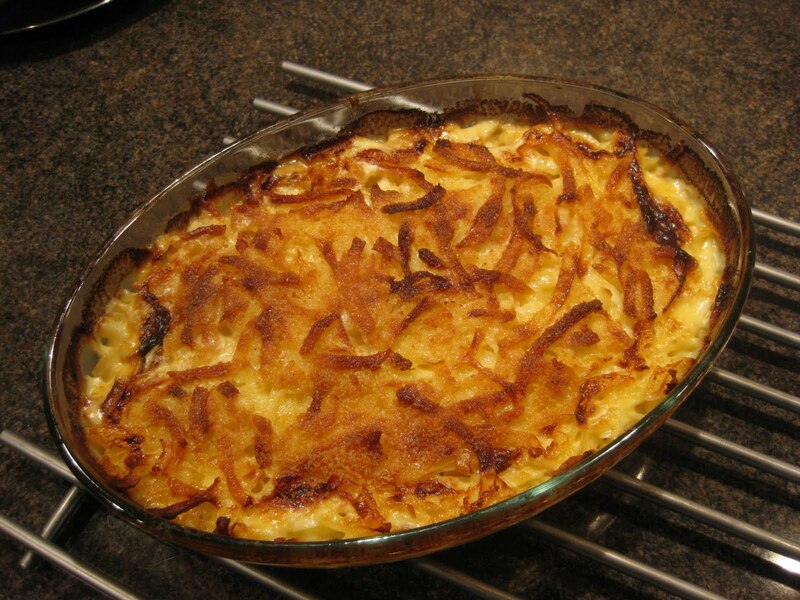 Janssons frestelse is a traditional Swedish casserole made of potatoes, onions, pickled sprats, bread crumbs and cream. It is commonly included in a Swedish Christmas smörgåsbord, but can be eaten on other occasions such as Easter. The dish is also common in Finland as Janssonin kiusaus. 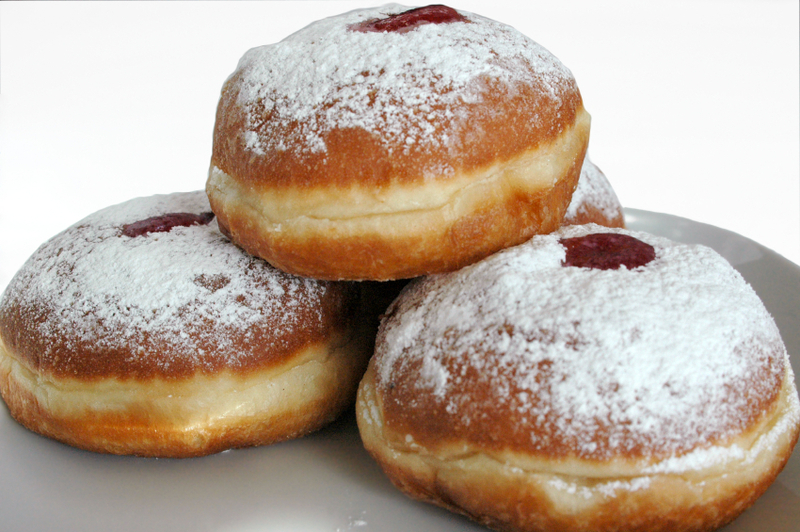 A sufganiyah is a round jelly doughnut eaten in Israel and around the world on the Jewish festival of Hanukkah. The doughnut is deep-fried, filled with jelly or custard, and then topped with powdered sugar. At Hanukkah, Jewish people observe the custom of eating fried foods in commemoration of the miracle associated with the Temple oil. 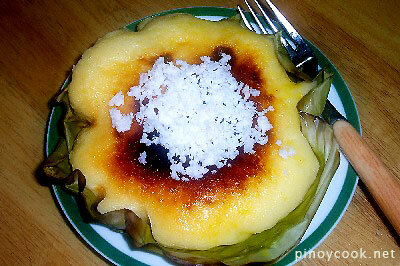 Bibingka is a type of rice cake native to the Philippines. This is traditionally made from galapong (milled glutinous rice), coconut milk, margarine, and sugar. The mixture is poured on a clay pot lined with pre-cut banana leaf and then baked. During dawn masses on Christmas season, side street vendors are a common sight preparing and selling this delicious rice cake . 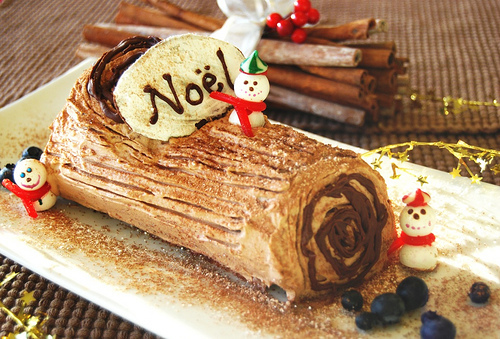 Buche de Noel, also called Yule Log, is a traditional dessert served around Christmas time in France. This dessert originated from an ancient Celtic tradition of celebrating winter solstice, the burning log was a symbol of rebirth of the sun. The Buche de Noel is made from a genoise or other sponge cake, generally baked in a large, shallow Swiss roll pan, frosted, rolled to form a cylinder, and frosted again on the outside. The Christstollen is a fruit cake containing candied dried fruit, nuts and spices; and often marzipan and covered with sugar or powdered sugar. Christstollen is a traditional German cake, usually eaten during the Christmas season. 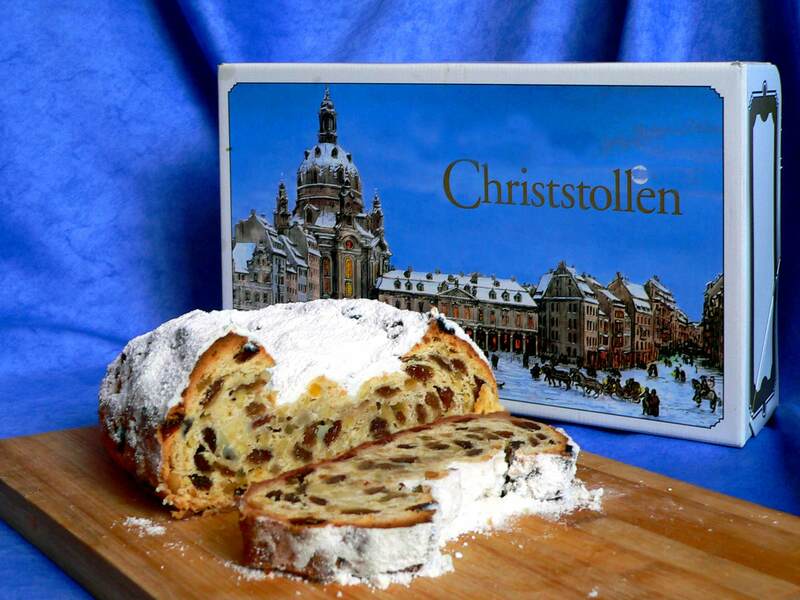 As a Christmas pastry, Christstollen was baked for the first time at the Council of Trent in 154. The Feast of the Seven Fishes is a celebration of Christmas Eve with meals of fish and other seafood. 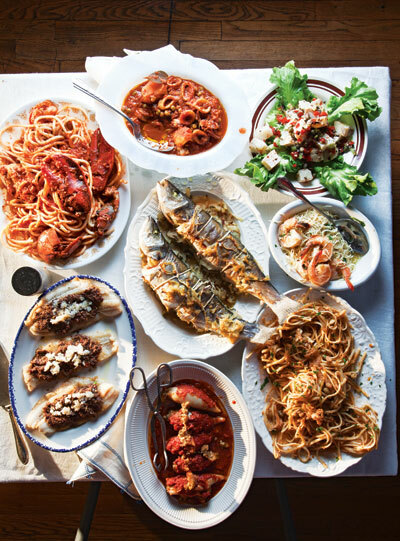 The feast that typically consists of seven different seafood dishes, however, some Italian-American families have been known to celebrate with nine, eleven or thirteen different seafood dishes.. This celebration commemorates the wait, the Vigilia di Natale, for the midnight birth of the baby Jesus. 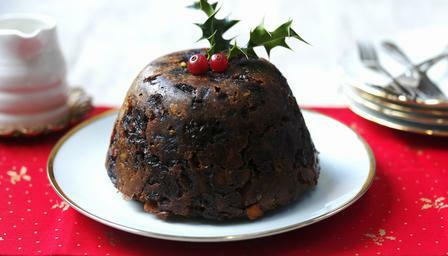 Christmas pudding is a type of pudding traditionally served on Christmas Day as part of the Christmas dinner. It has its origins in medieval England. The pudding is composed of many dried fruits and is held together by egg and suet, sometimes moistened by treacle or molasses. Also, flavored with cinnamon, nutmeg, cloves, ginger, and other spices. The pudding is aged for a month or even a year; the high alcohol content of the pudding prevents it from spoiling during this time. It was common practice to include small silver coins in the pudding mixture, which could be kept by the person whose serving included them. The coin was believed to bring wealth in the coming year.